It doesn’t happen often, but once in a great while politicians do the right thing for the right reason. I have a very dear friend who lost her only child, a beautiful daughter, and her son-in-law, a gifted medical researcher and fine man, in the balloon crash that occurred near Maxwell in Caldwell County, Texas on July 30, 2016. As it so happens, the son-in-law was the son of another friend of mine. A 5 year old son, my friend’s grandchild, was, very fortunately, not on the balloon ride. 15 passengers and the pilot were killed that day. A subsequent investigation concluded that the pilot was probably trying to land the balloon due to wind and weather and, in the process, collided with power lines carrying 340,000 volts of electricity. All of the balloon’s passengers were burned beyond recognition. The pilot had been licensed in 1993. He had an extensive criminal record dating back to 1987. He had been in prison twice for drug and alcohol-related offenses. He didn’t have a Texas driver’s license. His Missouri license had been revoked for repeated DWIs and he wasn’t even eligible to apply for a Texas license. A toxicology report on the pilot showed he had multiple prescription drugs in his system including Oxycodone, Valium, Prolev and Ritalin. The pilot had multiple medical conditions including insomnia and allergies for which he was taking Benadryl. At least 6 of the medications detected in his blood appeared on the FAA’s “Do Not Fly” or “Do Not Issue” lists. To cap it off, the pilot had a history of complaints from prior customers, including an injury, and on this particular day, chose to fly in weather (wind, fog and clouds) that was questionable enough that other balloon operators in the area cancelled their flights that day. 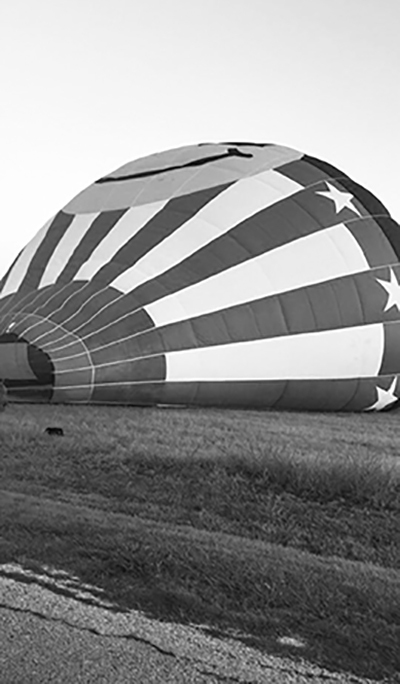 Photo by: Lorilee Brabson, taken as they were setting up the balloon for launch. Lorilee Brabson, along with her daughter, Paige Brabson, were among the victims of the crash / Photo acquired from the Austin Monthly article “Tragedy in Lockhart”. The horrific crash brought to light what to me is an inexplicable flaw in the law: the pilot of a commercial balloon is not required to have a certificate certifying medical fitness to fly. Instead, the FAA said it would expect the pilot to “self-report” if he were unfit to fly. I can’t begin to imagine how the survivors of the victims must have felt when they were told of this insanity. It actually gets worse. A pilot can begin to apply for a commercial license with 250 hours of documented flight time. Helicopter pilots must have at lease 150 hours to apply. There are strictly enforced licensing rules that require written testing and demonstrations of proficiency in flying. If you want to be an airline transport pilot, the requirements are: 1,500 hours of flight time (1200 for Helicopter), 500 hours of cross-country flight time, 100 hours of night flight time, and 75 hours instrument operations time (simulated or actual). Other requirements include being 23 years of age, an instrument rating, being able to read, write, speak and understand the English language, a rigorous written examination, and being of good moral character. On the other hand, a person can apply for a commercial balloon certificate with only 35 hours of flight time and an applicant is not required to demonstrate proficiency on bigger balloons such as the one that crashed. In short, this tragedy exposed gaping holes in safety regulation and a surprising and disconcerting difference in regulatory philosophy between the National Transportation Safety Board (NTSB) and the FAA. If any situation ever cried out for a regulatory agency to take action, this had to be it. But, nothing happened. After waiting a respectable time, elected officials from the area of the crash approached Representative Lloyd Doggett of San Antonio to ask for his help. Doggett then waited for the FAA to act. After a few more months of inaction by the FAA, Doggett filed a bill called the Commercial Balloon Pilot Safety Act. Doggett’s strategy was to add his bill as an amendment to the bill that authorizes funding for the FAA. The Doggett amendment mandates medical exams for commercial balloon pilots. The bill, including Doggett’s amendment, passed both Houses last week and is awaiting the President’s signature. It is too late to help the grieving families, but it is a victory nonetheless. For much more about this tragedy, read the excellent article by Gretchen M. Sanders, Tragedy in Lockhart, which appears in the October issue of Austin Monthly.